If the Northwood girls were going to have a shot at beating Blair, Yamu Sarr was the key. She was to run the 100, 200, 400 and possibly a field event and hopefully score a perfect 20 points against Blair. Northwood knew it would not be able to put up many points on Blair in the distance events, but Northwood had the edge in the hurdles and with Sarr could have had the advantage in the sprints as well. Things started off well for Northwood as Shaneil Thomas took the top spot in the 100-meter hurdles with a PR of 15.8. But Northwood's chances of victory crumbled when Sarr fell to the track grasping her hamstring in the open 100m. She was able to move off the track and ice the hamstring. It is not believed to be a serious pull, but Sarr was done for the day. And so the Blair girls ruled the day with their dominant distance squad complimented by a solid crew of sprinters. The discussion of a complicated three-way division tie between Blair, Northwood, and Kennedy would not be necessary. The Blair girls claimed the Division IV title outright with a 46 point cushion over Northwood. 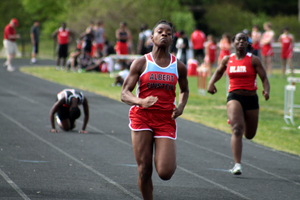 Highlighting the meet for the Einstein girls was Anna Ucheomumu who won the open 100m in 12.5, won the discus in 102-02, and won the triple jump in 34-05. There was little drama watching the boys meet unfold. It was apparent that the Einstein boys had the edge in a majority of the events. What was most interesting was observing how Einstein spread its athletes around knowing that championship season is just around the corner now. Stephen Ucheomumu had the county's fastest 55-meter time in December before essentially missing the second half of the indoor season with hamstring issues. This season, he has slowly worked back into shape one 100m at a time. Today he was slated to run two races, the first time he would do so in a meet in a while. Kicking off the day, Ucheomumu won the open 100 with a quick time of 11.0. Teammate Elijah Thomas finished close behind in about 11.3. Thomas came back later for a dominant win in the open 200m with a time of 22.6. Einstein used a B team for the 4x200 relay, but lined up the 'A' team including Thomas and Ucheomumu for the 4x100 relay towards the end of the meet. 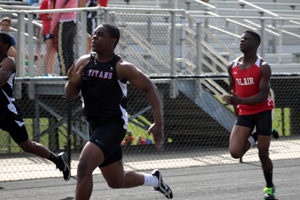 I believed that I was about to see the first sub-44 4x100 in MoCo this year, but it did not work out that way as Einstein dropped the baton on the second exchange and Blair won the race in about 45 seconds. When asked if Einstein would field an 'A' team for the 4x100 and 4x200 relays when the championship season came around, Coach Eric DaSilva said that they would have to wait and see how Ucheomumu progressed, but that they would probably have to choose one relay or the other when it came to running rounds in the open 100 and 200 at the big meets. The Einstein boys claimed the Division IV title without much trouble in its final dual meet. Nick Simpson won the 3200 after he was too ill to race a week prior, and Ben Withbroe doubled up in the 800 and 1600. Rene Molinari doubled up in the shot put and discus with marks of 46-10 and 130-04.